If David Lynch's son grew up in Japan and became a filmmaker like his father, and if his brain had a mouth, it would vomit Boogiepop Phantom onto our screens. Peppered with some of the best sound editing I've ever heard in an anime, this montage of scarred urbanites and neo-humans colliding into each other violently is the forbearer for anime hits like Baccano. Boogiepop Phantom began the light novel trend in Japan and has spanned multiple mediums to tell this fractured story of an urban legend stalking the streets of urban Japan dispatching creeps who feed on cute school kids. I could go more into the story, but that&rsquo;s not what a review is meant to do. If you want story, go read the synopsis or Wiki it. I'll talk about the viewing experience. This anime is heavy with mood, similar to Serial Experiments Lain in many ways, but what makes this anime stand out by itself is the superb sound production which not only elevates the content but is seemingly an essential part of it. The sound is a core part of the story, guiding the viewer through each sordid tale; through each blood-soaked tragedy, with its eclectic music (everything from electro, drum &amp; bass, to fusion) and reverberating soundscapes. Each episode plops you firmly into the point of view of various troubled characters battling demons both real and imagined, and all the while small threads appear and disappear, threads tying these character biographies into the larger mystery of what occurs in the opening five minutes of the show. A five minutes incidentally which are excellently written and directed, a perfect primer for what to expect with this show. If you feel like bailing out after those five minutes, then you should, because you won&rsquo;t appreciate what happens for the next eleven episodes, which is more of the same quality of storytelling. Boogiepop Phantom excels in both 'show dont tell' and voice-overs. I've lamented the usage of voice-overs in anime many times, calling it a lazy screenwriting tool, but it&rsquo;s used perfectly in Boogiepop Phantom. Character voice-overs actually tell us things we don&rsquo;t know, and give us insight into their motives. A review is meant to help make up your mind. If I were Miss Boogiepop Phantom herself, I'd shoot a psychic grapple hook into your mind and pull you into this trendsetting show so you could experience terror and awe, as only a viewer should when watching a classic anime. With the new “Boogiepop” adaptation recently being announced, I decided to revisit the old one, hoping the sudden news might finally give this hidden gem the recognition it deserves. Boogiepop Phantom is Madhouse's semi-adaptation of the on-going self-titled novel series from 1998, particularly the second and the third volume of the series, "Boogiepop and Others" and "Boogiepop at Dawn." It was released at the beginning of the year 2000, following the wave of deep, complex and esoteric shows filled with dark character drama that emerged as a magnitude response to Neon Genesis Evangelion's deep impact on the entire genre. Unfortunately, even though Boogiepop was a fairly strong representation of this period, having a confusing and disturbing plot, lots of well-explored controversial topics and a unique tone, the result was it being one of the most criminally underrated and underappreciated shows of its time. The reason for this mishappening is simply "being in the wrong place at the wrong time." The show was released soon after another genre-breaking classic for its time, Serial Experiments Lain, and remained hidden in its shadow without getting any recognition whatsoever, being casted off as simply another attempt to mimic the greatness. Now, while it definitely does borrow a couple of ideas from Lain, along with a similar type of storytelling and distinct tone, it takes a completely different approach to both the concept and the themes, striving for an entirely different goal. Told through a semi-episodic structure, Boogiepop Phantom follows the lives of young teens who have fallen victim to the consequences of a series of incidents dating five years into the past, some of who obtained strange supernatural powers. Among the students a rumor begins to spread, that of an unearthly creature lurking in the shadows of the city; a phantom-like entity that is believed to be the very personification of Death itself. And while the rumor is being laughed off, the children keep going missing. The story is told through a rather convoluted fashion. This type of storytelling feels more like a jigsaw puzzle than your regular chronologically-linear structure that is most commonly used. Boogiepop Phantom tells a story through several different timelines and a series of seemingly unconnected events that are told out of order. It is a rather methodical show, systematically introducing elements to the narrative that adds to the ever-growing mystery surrounding the series, but also providing enough evidence and information for the viewer to follow the plot on the most basic level. The series never caters the viewer by giving info-dumps or connecting pieces for them. Instead, the story is jam-packed with different plot elements and variables, and it can be hard to pick up on all of them. If you are a casual watcher and have a problem with banging your head against the wall trying to figure out where and how to fit single pieces of the plot into the puzzle, I highly recommend you to stay away from this series. The reason the show decided to use such a type of storytelling is because it allows the characters to take over the spotlight, leaving the story to unfold itself in the background. As I previously mentioned, the show revolves around a group of young teens striving on their way towards adulthood, and the series examines each character, allowing the viewer to project themselves onto them. This way, we are allowed to get to know and understand each of the characters: the way they observe and perceive the world around them, how they fit (or don't fit) into the society, the problems they face and the hardships they deal with. This is where the show gets a lot darker, as it touches upon some of the more disturbing and maybe even controversial topics regarding the lives of the characters. While it doesn't go into too much depth with the psycho-analysis, it does do an amazing job presenting the characters as individuals and helping the viewer understand them and what they are going through. This also allows the show itself to approach the story from different angles, and address certain subjects revolving around it, using the characters as googles to observe the world and the events. These stories are usually interconnected in one way or another, so they often intertwin. While the connections aren't important or necessary to the story and bigger picture in general, they are used as a well-thought reminder for the viewer to recall the past events, or the ones from the previous episodes, allowing an easier understanding of the whole piece. Now, while the show revolves around a different character each episode, there are a few characters (and entities) that are moving the main plot forward. I won't go into too much detail here, due to this being a very spoiler-heavy area, in order to provide a better viewing experience. Aside from Boogiepop, AKA the ''Angel of Death'', as referred to in the anime, another character worth mentioning is Kirima Nagi. Nagi is usually referred to as the ''Fire Witch'' throughout the show, due to her ability to use and control fire that she gained in the aforementioned incident five years ago. Being aware of how dangerous and uncontrollable her powers can be she decided to distance herself from her friends and people in general. She appears to be a superhero-like figure in the Boogiepop saga, being heavily devoted to protecting the world from whatever threats may come. Very strong both physically and mentally, Nagi is usually the one confronting the unknown entities throughout the series. Having that Boogiepop is not the only supernatural entity haunting the city, it is also the habitat of other creatures, such as the Pied Piper-like child who encounters people who have regrets in the directions their lives took, and takes away the manifestation of their youth, leaving but a raw, empty shell, or a fastly-aging, and seemingly autistic girl that plays with butterflies that can draw memories out of people. As you might have already guessed already, Boogiepop Phantom is a show that primarily revolves around dealing with changes throughout certain points in our lives. It uses memories, the ''borrowed'' concept of Serial Experiments Lain, to present the young teenagers' need to retreat from the reality that they are not used to due to their immaturity, and the consequences of turning to escapism. It shows their hopeless and unprepared struggle when having to take responsibility and face the consequences for the choices they made. Throughout the series, the characters are shown dealing with such in the most bizarre ways; having them create their own versions of reality, creating a rather distorted view of the world, or even locking themselves into their very own childhood memories, refusing to face up to the facts. And through such disfigured views, Boogiepop observes the entire society, leaving strong commentary on it. Where the show really stands out the most is in its audiovisual appeal. The show has a very unique visual design, especially when it comes to the design of the characters. They appear very humanoid, being completely devoid of the usual features characteristic for the anime medium, such as huge eyes, weird hair designs and unnatural hair colors. The reason for this is twofold: the main reason being the need to set the baseline of normality in the show, and establish the basic sense of realism. In a series where so many supernatural things happen the viewer must be able to distinguish what 'normal' is, in order to understand the abnormal. Secondly, the natural design allows the viewer to project themselves onto the characters more easily, and makes the drama all the more believable. It's also devoid of the usual anime gimmick in the form of caricature faces, exaggerated expressions, or anything that could damage the tense mood of the series. The show uses a reduced color palette to create a sepia-like tone, pulled through a vignette effect, creating a sense of emotional malaise. This not only establishes the unsettling mood for the series, which is afterall a horror/thriller show, but also helps put the main happening in the literal center of the screen. Unfortunately, Boogiepop suffers from the lack of budget and weak technical merits that are manifested through inconsistent animation, low-quality visuals and still shots. The sound design consists of synthesized avant-garde music carried by a leitmotif in the form of an active sonar pulse, and is mostly used to convey drama in the sound-mixing. As its predecessor Serial Experiments Lain, Boogiepop Phantom also feels the most comfortable playing with the silence, and using the loud, sharp electronic sounds to emphasize the important change in the mood change in tone. Unsettling, cryptic but overall insightful, Boogiepop Phantom is a horror that treats both the viewer and the genre with respect. It is a very mind-boggling show that never takes itself too lightly, and doesn't expect anything other than that in return. If you are willing to fully commit to it, you can expect to be heavily rewarded in the end by everything that this "spooky sepia puzzle" has to offer. If I were to describe Boogiepop Phantom in 5 words or less, it would be: dark, atmospheric, strange, confusing, and more importantly, outstanding. So what makes this show outstanding? Well that's where this review comes in handy ; ). First off, Boogiepop is a horror anime, pretty much like Elfen Lied and Higurashi no Naku Koro ni and all three shows also have a few similarities: blood, gory violence, very disturbing, great art and animation, and a dive into the human psyche. But then again, there are the differences between the three and what makes Boogiepop different from the other two is also what makes it so amazing. What makes it truly stand out completely is the art/animation. Throughout the entire show(except the last episode), the art is done in a dark, hazy, blurry, sepia tone; the animation is good but sadly the character designs are very bland and make it almost impossible to tell everyone apart. Both art and animation are really good, but they make the show a lot more confusing the it's own plot line which I will get to right now. The story for the show is very non-linear, if you go into this without knowing anything about it, you'll get left behind scratching your head for sure. Boogiepop takes place in an unamed city in Japan where a month ago, a pillar of light appeared out of nowhere and strange things start to happen along with some nasty murders that seem connected to another killing spree from five years ago. Actually, trying to come up with a brief synopsis for this show is honestly very difficult, so lets just leave it at that for now. From time to time, the show would focus on a certain character and learn about them and their connection to the events. Just like the works of Satoshi Kon, Boogiepop is very very psychological and when it comes to the human psyche, it goes in way deep than you would image. There are also some themes in this show such as: change, relationships, dualism, and escapism. Finally sound; not only does Boogiepop having great sound editing, but it also has some of the best music ever composed in an anime. The music mainly consist of gregorian, experimental electronica, and mostly just sound effects made for the anime. I haven't heard much of the Japanese dub, but the english dub is really good; Right Stuf International did a great job with the dub if I say so myself. 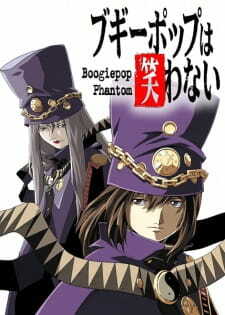 Elfen Lied and Higurashi are indeed both great horror anime, but to me, Boogiepop Phantom is one of the most underrated horror anime as well as one of the most overlooked anime in general. I highly recommend this to anyone looking for something good and scary to watch. Multiple viewings are a must for Boogiepop Phantom. Dementia is one of the rarest genres when it comes to TV anime. There are currently only 3 of them listed on MAL: Neon Genesis Evangelion, Serial Experiments Lain and Boogiepop Phantom. Most anime watchers have probably heard of the first two countless of times while Boogiepop does not get the same amount of recognition. So why is Boogiepop not considered a classic as well? Let's start with the story. Boogiepop has an episodic and non-linear structure that works surprisingly well. Each episode focuses on one character and a theme related to said character. Some episodes move the plot forward more than others, but each of them adds something to the main mystery. In the end, none of them serve as filler and all have some relevance to the plot. The themes in Boogiepop are complex and mature, there are few shows that manage to be analytical of the human psyche in this way. There is however one big downside about Boogiepop's approach, and that is a lack of focus. Sure, it covers a fair amount of themes, and for the most part it does it well, but it never puts a lot of focus on the same one since we do not get to follow the characters for longer than one episode. It is enjoyable to watch for what it is but we do not spend enough time on a single theme for it to have that much of an impact, lowering the memorability of the series. Another thing that deserves mentioning is that it can feel a bit convoluted at times, but it never gets to the point where it becomes too overwhelming and loses its meaning. The episodic nature of the show serves the mystery well, establishing it early on in its first episode. Throughout the entire show, it keeps adding tiny bits to the puzzle until we finally get to see the whole picture. Each episode raises its own questions about the story, that are answered in a later episode that showcases another perspective on the events. The way we got to see how the actions of one character made an impact on other people’s stories was interesting. The way this is handled is masterful, making every episode both intriguing and satisfying. On the flip side, there are two problems with this aspect of the show. For starters, not everything gets explained. There are plot threads that do not get a proper resolution. But to be fair, the main mystery does, so that problem ends up being merely something that could have been improved on. The second one is that a lot of characters look too similar, making it sometimes hard to identify them, adding some unneeded confusion. Apart from that, the art on its own is nothing too special, the character design is pretty cookie-cutter and has a realistic look to it, but the dimmed down color palette is what makes the visuals stand out. Animation-wise, this show does not have much to offer. There is usually not much movement happening in each frame, sometimes none at all, and it even goes as far as to replace animation with footage of real people walking for no other discernible reasion than to save budget. So why does it not fail in this department? Because it works well together with the sound to create a somber atmosphere. Boogiepop uses sound effects extremely well, it is arguably what the show does best. Most of them are electronic sounds, which not only fit the story, but also complement the scenes in which they are used to create the strongest possible atmosphere. The music tracks are solid, working well in favor of the anime whenever they play. Perhaps the reason it works so well is because it is a different approach to sound that is not frequently used in anime. Using silence to build tension is another trick that Boogiepop has up its sleeve. All that being said, what factor about the show brings it down to "only" being a good anime? That would have to be the characters. While the cast is not bad, it is not exactly good either. The main problem of the cast is that it is not memorable at all. With the focus being shared between a lot of them, none serve to make an impact in the long run. They are enjoyable to watch for what they are, and work well in delivering the theme they are set out to deliver but none of the characters get enough time in the spotlight to be remembered. Add the fact that some of them are flawed in their execution and do not do much outside of filling a specific purpose, and in the end you get a cast that is nothing special. On the flip side, some of the more enigmatic characters fill their niche quite well. The way they are presented contributes to making them interesting, and revelations about the mysteries surrounding them are handled in a satisfying manner. Compared to the episodic characters, the main characters do not get explored much, if at all, though they still serve their purpose just fine. In fact, that would be the best way to sum up the entire cast of Boogiepop Phantom: they work for what they are, but they do not make a big difference to the series as a whole. Despite its not so impressive cast, Boogiepop manages to be entertaining throughout, in quite a few different ways. Both as a psychological show, thanks to the thematic studies, but also as a mystery show because of the way the plot is presented. It even scratches the horror niche because of how atmospheric it is. Through clever use of audiovisuals and content it delivers on the tension well, and is sometimes straight up uncomfortable. Perhaps because of the variety of genres Boogiepop Phantom combines, the show never got boring to watch. While not the most memorable anime in history, nor one that everyone will enjoy, it is definitely a good show. But it also could have been so much more if it just had a more memorable character cast. Still, a definite recommendation. Boogiepop is getting a new TV anime !